Centrifugal fans are often used to convey material around production lines. In one drinks canning plant, a six-bladed radial fan in the filler room, delivering 3 m3/s of air, supplied air to move cans along lines. The fan produced a tone at about 300 Hz with an A-weighted noise level of over 90 dB. It was decided to adopt an active noise control solution. This consisted of a digital signal processing controller producing a digital model of the noise. 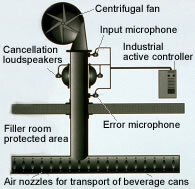 A signal microphone fed information to the controller which then produced an inverse sound wave from the loudspeaker. This 180 out-of-phase wave combined with the noise, cancelling it by destructive interference. A second microphone analysed the operation of the system and adapted it continuously to take account of system changes. Equipment manufactured by Digisonix Inc, USA.